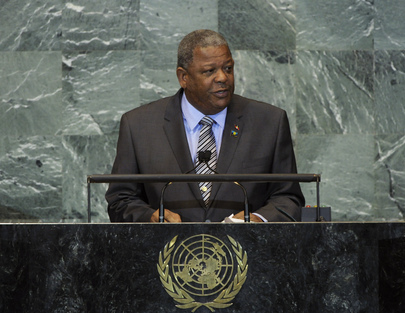 WINSTON BALDWIN SPENCER, Prime Minister of Antigua and Barbuda, said mediation was a bedrock on which the United Nations was founded and there was a growing interest in its use as a cost-effective tool in peaceful dispute settlement. The international community had repeatedly recognized its role in creating conditions conducive to lasting peace. Turning to the Middle East, he recalled that last year, he had urged the implementation of the two-State solution, which would see Israel and Palestine living side by side in peace and security. Yet, that solution had not been realized. Fully supporting the two-State solution, he joined others that had recognized the State of Palestine, believing that such recognition would help create lasting stability in the region. On the issue of illegal trade in small arms and light weapons, he said it had been linked to the associated rise in violence and adversely affected economic and human development in his region. The United Nations Office on Drugs and Crime (UNODC) and World Bank had reported that his region had the highest murder rate in the world and that those weapons had been used in the commission of more than 70 per cent of those murders. “This dubious designation we never sought and it is neither welcome nor desired”, he said, adding that in July, Antigua and Barbuda joined other CARICOM members in adopting the Declaration on Small Arms and Light Weapons to accord the highest national and regional priority to such matters. Turning to the economic crisis, he urged the creation of a sovereign debt restructuring and debt resolution mechanism that took into account the various dimensions of debt sustainability. The seemingly unending crisis had affected countries in his region in both economic terms and through barriers to trade and finance embedded in some of the anti-crisis measures adopted by developed countries. While Antigua and Barbuda had made progress with the United States on their online gaming dispute, he urged the United States to remain committed to reaching a mutually agreed outcome that would bring value to his country. In a similar vein, he urged the United States to lift its blockade against Cuba. In the area of non-communicable diseases, he said the political declaration adopted at the General Assembly’s recent high-level meeting on that topic had not fully developed a clear goal for launching the global campaign and corresponding road map. If rigorously implemented, however, it would contribute to the attainment of the Millennium Development Goals. Also, the legacy of slavery, segregation and racial violence against peoples of African descent had impaired countries’ advancement, and he called on former slave States to issue formal apologies for the crimes they had committed over the 400 years of the African slave trade. He also urged those States to back up their apologies with new commitments to the economic development of nations that had suffered under that human tragedy. Further, the African Diaspora Summit, to be held in South Africa in 2012, would provide a platform to put in place economic policies aimed at ensuring sustained economic cooperation among public and private stakeholders, he said. On other matters, he recalled the need to prioritize population dynamics when developing policies to promote health and dignity. Investing in human capital and measures to promote both gender equality and youth participation in all spheres would help developing nations transform their economies. Policies that responded to peoples’ needs were also required for tackling challenges related to food, energy and water. In his region, Antigua and Barbuda fully endorsed the objectives of the Community of Latin American and Caribbean States. To respond to the economic crisis, members of the Eastern Caribbean Currency Union had upgraded their economic integration arrangements and established an Organization of Eastern Caribbean States (OECS) Economic Union in January 2011. The Eight Point Stabilization and Growth Programme, adopted in 2009, aimed at transforming their economies, while fiscal targets aimed to help them achieve a debt to GDP ratio of 60 per cent by 2020. Antigua and Barbuda was also committed to intensifying national efforts to create legal, social and policy frameworks to eliminate stigma and violence related to HIV.